Do you want to boost team moral & create more productive workplace?? What better way than to get the team out of office for a fun filled, team bonding afternoon!! Surf Skool Corporate Program offers a 4 hour surfing experience program in one jammed packed afternoon of fun and excitement. Surf Skool can even transport the team from the office to the selected beach, provide all equipment, and host a refreshing afternoon tea by the sea. All surf coaches are experienced corporate fitness specialists and our program is guaranteed to boost your team's fighting spirit. 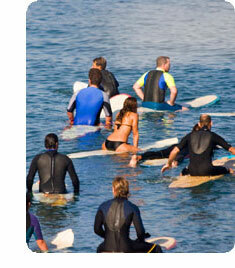 Surf Skool Corporate also offers team building sessions in boxing, bootcamp, Pilates and other fitness based activities. Sessions and programs are based on numbers and office location so please feel free to contact us for a quote today!